Which industries are currently driving the Queensland economy? I’m very interested in hearing James’s views on what industries might make a greater contribution to the economy now that mining is in decline. Based on recent building approvals data, it appears residential construction will make a much greater contribution (see Apartment and townhouse approvals double in January). Also, aged care, health and education will surely continue to grow in economic importance over the next few years. 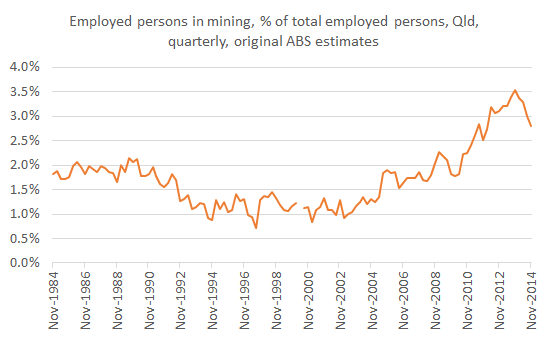 Given the large economic shock coming from the mining downturn (e.g. see Qld receiving huge economic shock from resources sector capital spending decline), let’s hope these other industries perform strongly over the coming years. 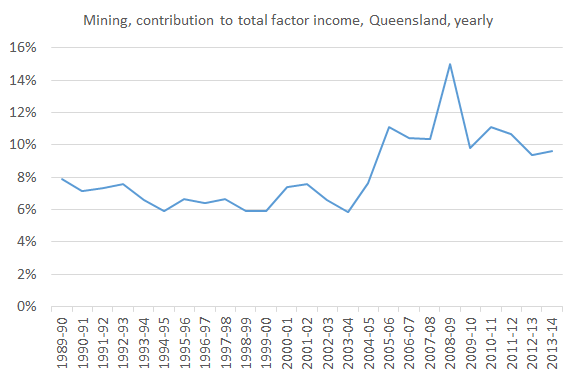 While the importance of mining to Queensland has waxed and waned over the decades (see charts below), and the Queensland economy is much more than any one sector, there is no doubt the mining downturn will create hardship for many workers and businesses, and will cost the Treasury a large amount in lost royalties. This entry was posted in Housing, Mining and tagged construction, industry, mining, qld, qldeconomy, queensland. Bookmark the permalink.